Several users of Binance have complained in the last hours about having their accounts shut down. It seems like Serbia is the country with most affected users, but citizens from Bosnia and Herzegovina and Belarus are also reporting the same issue. The first complains arrived to social media a week ago. As the first Serbian Twitter user reports, who seemingly had completed the optional KYC process, he received a message requesting him to withdraw his funds. For anyone in Serbia...Binance has lifted trading ban..move ur crypto to wallet and sleep easy.. In the last 24 hours, the crackdown appears to have extended to many more users, judging from social media complains. Serbians were predominantly affected, judging from their large presence amongst protestors in Twitter and Reddit. Bosnia and Herzegowina is blocked from today! To bad and very sad for us... i hope #Binance can fix this in future! Have friends out of Serbia, Belarus, Bosnia complaining about being booted out of @binance today. Reading that Cubans, Venezuelans etc are getting the boot as well. Russia next? So, @cz_binance, caved in under global elite pressure to ban users from sanctioned countries? Shame. But I think you have to explain why you ban people from Myanmar 🇲🇲 using binance ? #binance why you keeping it quiet? It seems as if this regional crackdown might be related to compliance with financial regulation in these countries, more than to sanction lists. But just as in the case of Iran, sadly the hardest blow will be taken by common users. 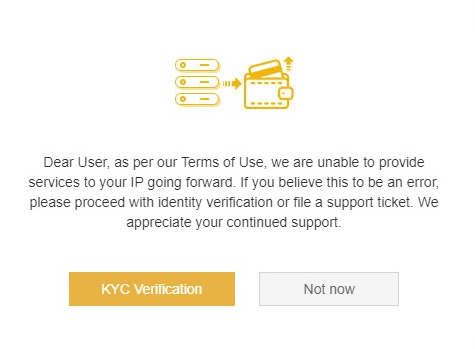 Has your Binance account ever been blocked?